A new Guest Blog from Michelle Michaelson (Silver Fox Operations Director). Silver Fox are market leading manufacturers of Cable Labelling solutions worldwide. Cables and wires must be contained and correctly labelled - safely. Whether onshore or offshore, the oil and gas industry is exposed to the severe challenges of maintaining safe working practices in potentially explosive atmospheres or hazardous areas. 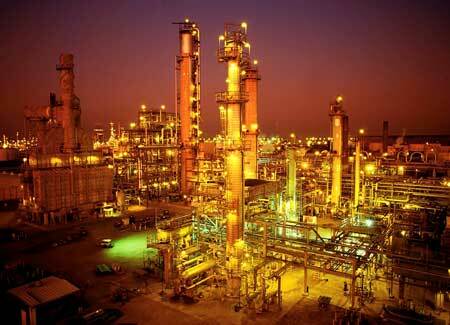 Basically, the classification of a hazardous area into Zone 1 or Zone 2 is determined by the time period a flammable atmosphere is likely to be present under international Directives, such as ATEX. Silver Fox cable and wire making label systems are "cold-applied" (with the exception of heat shrink) and are therefore compatible for use within hazardous area locations posing no ignition source threat to the "Fire Triangle." Unlike traditional heat shrink wire and cable marking systems, Silver Fox can provide cold-installed cable labelling/ferruling for use in hazardous areas where working conditions preclude the application of naked flames or "hot-working". 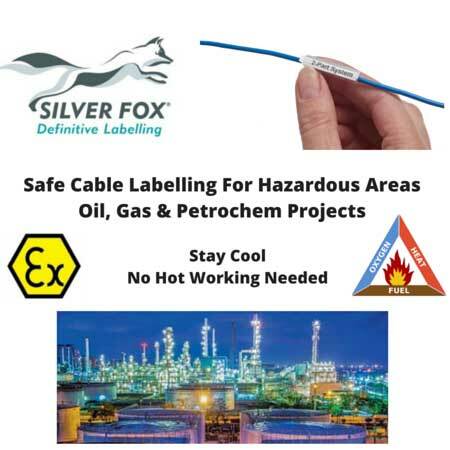 Advanced specification and performance wire marking and ferruling systems from Silver Fox provide safe and cost-efficient labelling of cables and wires located in hazardous areas and potentially explosive atmospheres. When it comes to labelling wires and cables in hazardous areas Silver Fox have found the answer with 2 safe solutions. One of the most straightforward and easiest is the computer generated Silver Fox Two Part cable labelling system. Comprising of a clear plastic tube with two 2 recesses; one for the wire and one for the label. The recess for the cable label remains the same size while the size of the recess for the wire changes for different wire diameters. Each sizing has tolerance for a range of different cable or wire diameters. Diameters from 2mm to 5mm are accommodated with just 3 different sizes covering diameters from 1.5 mm to 5mm. Labels and tubing are available in 3 different lengths; uniquely there is a 50mm that can accommodate even the longest ID's 25 to 30 characters and in some circumstances more. The second solution is Legend Non-Shrink Tubing. Durable PVC tubing that can be printed through the Silver Fox DTP1/300 thermal printer. An alternative to heat shrink at 20% of the cost. When fitted, the special oval design tube, stays exactly where it is placed. Additionally, up against individual ferrules at approximately 30% of the cost, it represents a very powerful solution. Plus, there is no need to stock 0-9, A-Z as printing onto blank tubing means all characters are available. A recent trial printed 25,000 25mm labels in 4 hours, that’s 100/minute. Driving this product is the Fox-in-A-Box®. The Standard level, including: thermal printer/thermal ribbon/Labacus Innovator® Standard Software costs £500. Printing speeds are also very good saving time on preparation and onwards to overall installation time. The idents can be turned in any direction for easy reading. The idents can be changed after application without cutting the wire. This is particularly useful as a project progresses as idents can be easily changed and the wire does not need to be cut or re-terminated or the circuit re-tested. The Fox-in- a Box starter kit includes the printer, ribbon and lead starts for as little as £500 + vat + carriage. Are Silver Fox Cable Labels Easy To Install & Remove? Yes, Silver Fox have a special flexible design so the installer can pull the label into a clear tube mounting. Silver Fox have developed this because rigid options can suffer from over tightness which in turn results in difficulties inserting/removing the label block from the clear tube. By using flexible plastics, Silver Fox addresses these issues, while still offering a fully durable wire and cable labelling solution. Leave the tail of the cable label on to the end of the project – this makes the cable label even easier to remove.